After the EIS 2014 and MIS 2015, this is the third time that Grupo Eventoplus confidentevenTwo to develop the App for their events. In this case is evento Days, the main events showroom in Spain. Always a pleasure for us as our best sales tool is that users try our Apps. This event was the first in which we have put in place Beacons integration, thanks to integration of evenTwo with TapTap. This allowed features such as sending notifications to App users passing through a particular location, or have an online heat map of where moved in the venue. In addition, the App contains all the information of the event, Networking features among participants, polls and surveys. The App had 540 downloads, 271 in iOS and 269 in Android. Curious that are so close both platforms downloads. Normally, even in Spain there are almost 90% of Android devices and 8% of iOS devices, in most professional events more than 60% of users work with iOS and 40% with Android. This difference usually occurs because the iOS user is more likely to download apps that the Android user, and professional users use more Apple products than the average user. As we see in evento Days and other events in the last year, this trend is matching. Of the 540 downloads, 288 users were logged with LinkedIn or registered, 53% of the total amount. Users who didn’t login could not access private areas of the App, as comments wall, list of participants or messages between participants. We understand that 47% was not registered because the app is downloaded for public functions, such as the agenda, speakers and event information, and had no interest in the private areas. Normally the percentage of the total number of registered users downloads usually exceed 80%, but it certainly depends on the type of event and the interest that users have to interact with other participants. 35 photos shared by users in the App. 340 private messages between participants. With evenTwo we are able to know which screens within the App users have passed. We have a complete statistics module allowing the organizer to know what points have aroused more interest in users. The main screen of the app, in addition to access to the main features, was the sponsors carousel, was viewed 8,425 times. The event’s agenda was consulted 3,353 times. Comment Wall was consulted 1,966 times. The list of attendees was consulted 1,936 times. The list of exhibitors was consulted 1,775 times. The list of sponsors was consulted 730 times. Users added to its agenda sessions 643 times. With Beacons integration that with we developed with TapTap for evento Days, we are able to know where users moved within the event, generating a heat map that was available online by the App. 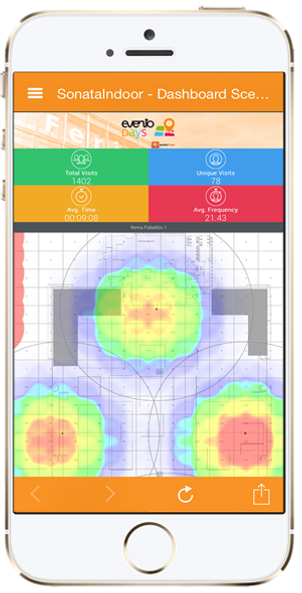 The Beacons detected devices with App 1,402 times, the hottest point of the place was the entrance area, as shown in the heat map.